In a first, Bengaluru saw a movement for sustainable transport, that resulted in a no-vote campaign. The no-vote collection drive conducted by the team Citizens for Bengaluru secured 41848 votes against the flyover planned on Bellary Road in Bengaluru, from Chalukya Circle to Esteem Mall. The event conducted on Sunday, October 23, 2016, also showcased how the issues related to sustainable development or the lack of it were deep-rooted in political will. Clarifying why there were no ‘yes’ votes in the campaign, one of the organisers of the campaign, Srinivas Alavilli, said that the government was already hearing those who say ‘Yes’, and this no-vote collection drive was an effort to make the government hear the ‘No’ of the people who want the government to take a step back and hold public consultations. In a presentation, city-based architect Naresh Narasimhan who was also a volunteer in the campaign against the flyover, explained the rationale behind asking the government to withdraw the project. He also suggested alternate ways of decongesting the stretch from Chalukya Circle to Hebbal (listed here: 1, 2, 3 and 4). He ended his presentation with a video that showcased the trees and the scenic view on which the flyover will take a toll. Video courtesy: Citizens for Bengaluru ; Series production: Deepti Sudhindra, Harshad Palsule. Bengaluru-based historian Ramachandra Guha spoke about the fascination towards megaprojects displayed by Indian politicians. He said that Jawaharlal Nehru promoted many mega projects, but later he regretted some of the steps he took. In 1958, Nehru gave a speech to a meeting of engineers, in which he deplored the decease of gigantism – big projects. In those times, gigantism was a product of folly, but now it is a product of fraud. “It is universal rule cutting across all parties – the larger the project, the larger the cut,” he repeated, and proceeded to question the timings of the flyover and haste behind executing it. What’s happening in the case? A public interest litigation filed by Nama Bengaluru Foundation (NBF) will be heard on November 2nd, 2016, in the High Court. In a meeting called by Bengaluru Incharge Minister K J George on Tuesday, October 25, 2016, BJP and JDS MLAs questioned the rationale of hurrying up with the project when many other projects were pending. Independent Rajyasabha MP Rajiv Chandrasekhar asked why the government did not survey the possibility of alternate roads, and asked the government to hold public consultations. TV channels reported that the BJP and JDS leaders walked out of the meeting when the government did not listen to them. Indira Gandhi had a ‘deep and abiding concern for environment’. She shelved the silent valley project after experts advised her against it as it would harm the biodiversity of the area. Jairam Ramesh, former Minister of Environment and Forests, is now writing a book on Indira Gandhi as an environmentalist. “I don’t know how Ramesh or his party is going to square on the book, in the background of what’s going to go on here,” said Guha. He added that Siddaramaiah, hard-working, a grassroots politician with credible records, came in as the chief minister from Congress Party, with a lot of goodwill among people for him, in a situation where BJP was neck-deep in mining-related corruption. “Now he has become captive to ministers with special interests, what is the legacy he will leave behind?” he asked. Professor Sundar Sarukkai, a mathematician and a philosopher, had joined the human chain event held last weekend. He spoke on what is it to belong to a city. He termed the movement an extremely important landmark in Bengaluru’s history. He said the coming together of people from different walks of life to express their opinion on a public project seemed very important and inspiring. He pondered about what it was to belong to a city, and how does one belong to a city. Bengalureans are private people. To belong, is to get out of one’s comfort zone and share oneself with the public, to develop a sense of shared responsibility towards public issues and talk about them. When politics cannot create the possibility of people from different backgrounds coming together and agreeing on something, the society needs to create such spaces. There are two such areas that creates such spaces – art and education. Education is an important space that can create radical dissenting public discourse and debates. Bengaluru does not support these two areas enough – artists and education – it’s shocking, said Sarukkai. Gopal Guru, a professor from Jawaharlal Nehru University, spoke on inclusive city. Cities are fundamentally hostile to poor. In many cities there are spaces divided with invisible barricades that force some people to become invisible, he said. Planners have certain rules for building a city that is inclusive, which are not followed in reality, including the current project in question. Market is being kept in mind when designing cities, he added. He explained how the spaces under flyovers hide the ugliness in the city, and create a set of people who don’t see themselves belonging to those flyovers. Though a canonised image of the city is projected, a city cannot come into being without the presence of the grotesque, he said. He emphasised the need for technological innovations that will include the poor and neglected in the city’s social fabric. Professor T V Ramachandra spoke about ecological impacts of unplanned urbanisation in Bengaluru, lakes, water issues, transport issues etc. Professor Ashish Verma of India Institute of Science spoke on how cities world over learned from going to building flyovers and then coming back to decongesting them by investing in public transport and non motorised transport. Bengaluru need not reinvent the wheel but can learn from these cities, he indicated. The demand for private transport, congestion, pollution etc will never decrease if there is no emphasis on public transport, he added. Bengaluru has 150 cars for 1000 population currently, it will increase if we don’t leapfrog, he warned. Harish Narsappa, an advocate and founder of Daksh said courts may not help always in civic battles, hence engaging with politicians in one’s own areas was essential. Projects involving big money attract attention but small projects such as footpath, garbage etc go unnoticed. Citizens should be vigilant in their own areas, courts are limited in what they can do in civic issues, because politicians and bureaucrats find creative ways to avoid implementing court orders, he added. Katte Sathyanarayana representing Bhartiya Janata Party (BJP), Tanveer Seith representing Janata Dal (S) and Vinod representing Aam Aadmi Party (AAP) supported the campaign. At the end of the event, no-votes collected over two days in many areas of the city were counted and declared. More than 100 volunteers helped collect 41,848 votes. The team has intensified the campaign by reaching out to people’s representatives, garnering more public support to the issue and planning tree vigils. The videos have been embedded here with permission from the producers of the video and Citizens for Bengaluru team. 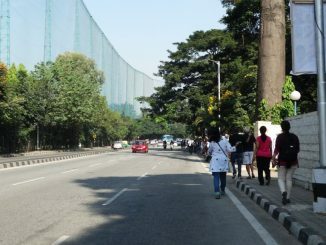 Steel Flyover issue: Is Bengaluru’s Civil Society scoring self goals? As the controversy regarding Venkatappa Art Gallery slowly fades away, artists are hoping to help the government in making the Gallery an active tourist spot. Is it going to be only 812 trees? Think again! Author requests the government to allow more time to find a proper solution to the traffic problem, to be more inclusive and allow more qualified minds to come together to settle steel flyover issue. The fight citizens have been fighting on a mega project on Bellandur lakebed has come to an end, with the National Green Tribunal asking the developers to pay fine and vacate the encroachments. What more does the judgment say? Read more. Good thinking! This is why tunnels should be built at the cost of the vehicle owners – right now we (vehicle owners) are taking a free ride on the general public’s health, wealth and sanity by creating roads on public land without paying the full price of the damage to the environment and those living on the land around (Include humans, animals, trees …). The tunnel should be a closed system – nothing goes in, nothing comes out – except vehicles. All the byproducts produced by the vehicles to be cleaned up by charging the vehicles suitably. Do you know what it takes to build a tunnel.. it should be public transport what makes the city sustainable. u increase the capacity of road more vehicles to follow. Simply these two ideas alternative to #SB 1. Create 6 Lanes tunnel road from Le-Meridian to just after Hebbal flyover 2. Build monorail from Majestic to KIAL Passengers from Metro and City railway station can get easily access to Monorail if its constructed. . While creating tunnel road all the work carried out under the ground hence normal life not at all affected on Bellari road.